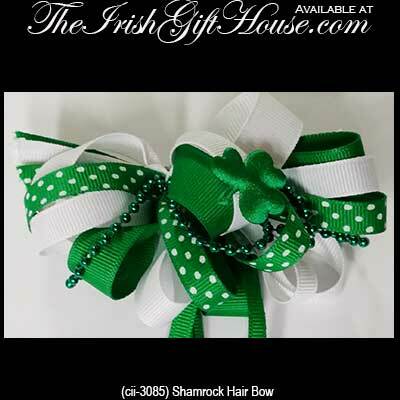 This shamrock hair bow would be a grand fashion accessory on St. Patrick's Day! This Irish hair bow features a cloth shamrock along with stacked green, white and polka dot enhanced ribbon and it is further enhanced with green beads and a metal French barrette clip. 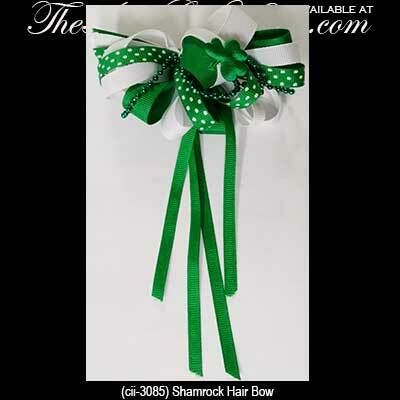 The Irish bow measures 4 1/2" wide while the shamrock is 7/8" wide. The shamrock hair clip is further enhanced with four different ribbons that range from 5/8" wide to 1/4" wide, and the clip is 2 1/2" long. 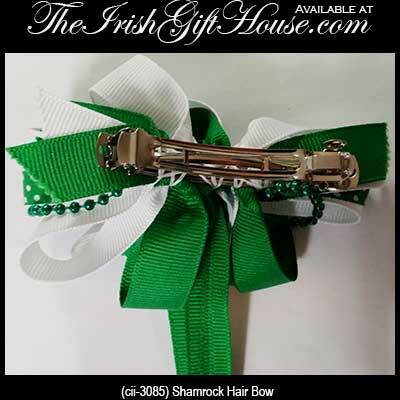 The Irish hair clip is received with a shamrock history card, complements of The Irish Gift House.